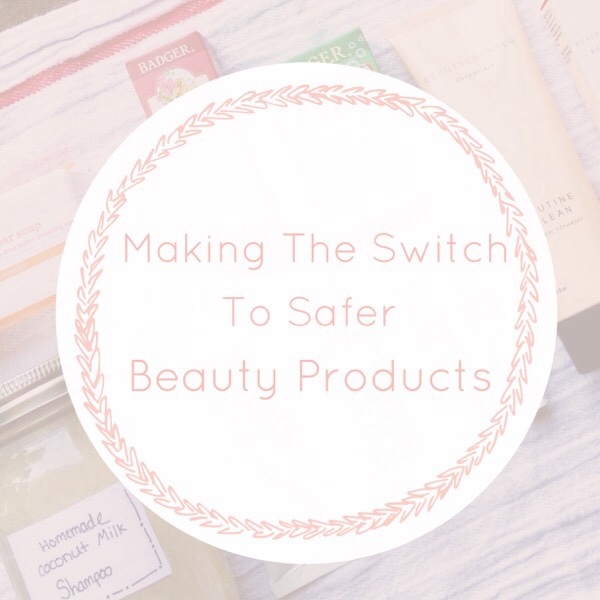 I am getting serious about living a hazardous chemical-free life, and I have taken some major steps in making my beauty regime safer. As I explained in my Beautycounter Event at Park Kitchen post, the government allows cosmetic and beauty product industries to put harsh chemicals, and weird ingredients into their products. I am not comfortable with that at all. I am not comfortable with putting harsh chemicals on my face, and body so I am doing something about it. I have always been interested in living organically, so in the past, I have made many homemade face scrubs, powder foundations, and I also made my own deoderant. You can read about my homemade, powder foundation here, and about my homemade deoderant here. On Saturday, I made homemade coconut milk shampoo. I will talk more about that, and include the recipe in a later post. I feel better knowing harsh chemicals are not seeping into my scalp, and that my hair is clean, nourished, and hydrated. It is completely safe, and I made it with 100 percent organic products. I scanned the shampoo and conditioner that I normally use with EWG's Skin Deep app, and found out that it was given a score of 3. A score of 3 isn't so bad, but I would rather use my homemade shampoo that would probably be scored a 0. 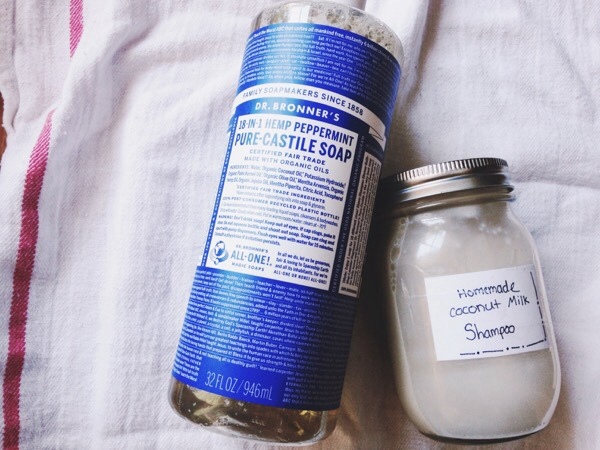 In my homemade shampoo, I used Dr. Bronner's Pure Castile Soap and I love the way it cleans. I am even replacing the soap that I use at work with this Pure Castile soap. I bring a little travel bottle with this pure castile soap in it to work, and I wash my hands with it instead of the harsh, antibacterial soap that is provided. The antibacterial soap ruins my hands, and makes them raw, and rashed. The Pure Castile soap is incredibly nourishing, organic, fair trade, and gentle compared to the harsh, antibacterial soap. I have recently made some great purchases toward my transition in using safer products. 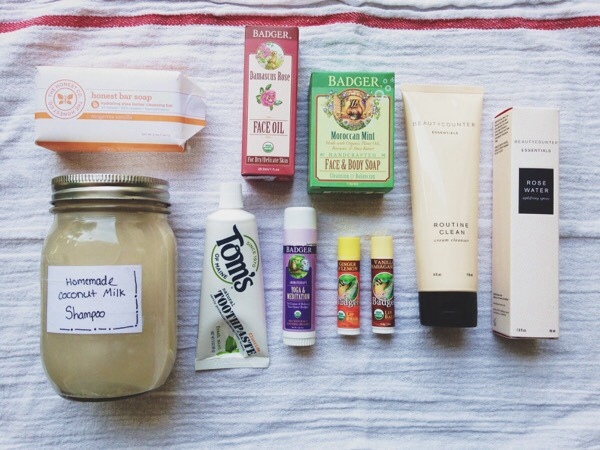 I bought these wonderful products from companies that value what ingredients are put into their products. They value natural, simple ingredients, and they don't include harsh chemicals in their products. Instead of using body wash from NIVEA, I use this amazing bar soap from The Honest Company. I cut a piece of the bar soap off every time I shower, and it smells fantastic. Another great company that I have always raved about is Badger Balm, and their amazing products. I am using their Damascus Rose Face Oil as my facial moisturizer, and I love using the Yoga & Meditation balm at night. I can't wait to try their other products that I purchased. I also love Tom's products, and actually, my teeth feel cleaner when I brush my teeth with Tom's toothpaste. Something that really irritated, and worried me about my old toothpaste was that it basically said on it's tube that it was poisonous. I do not want to put something in my mouth that is toxic. That is why I switched over to Tom's, because I trust the company, and it's not toxic. 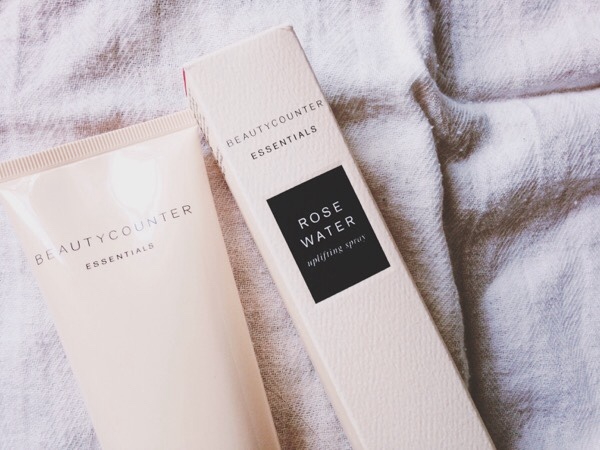 I also purchased my favorite cleanser from Beautycounter's Essentials line, and their Rose Water uplifting spray. I have been using this Rose Water as my "makeup" for the past week. It feels wonderful knowing that these products are safe, and have no cancer causing agents in them. Gentle products with gentle ingredients, that is what I love. Beautycounter is what really pushed me forward on this venture. Ever since the event that I went to a couple Wednesdays ago, I have been looking at my products, weeding out the products that are harsh, and adding in safe products that have no harsh chemicals. I owe this transition to Beautycounter, for they inspired me to live my life safer, and harsh chemical-free. I don't know why I didn't do this earlier. It is easy to incorporate the safe products as part of your daily regiment, it takes passion though. I am really excited to keep going in my transition and make it my life. Living safely is my life now. I will share a little more about Beautycounter in a later post, and the wonderful steps they are taking to make cosmetics safer and a little more regulated. I am really excited about this new transition for safer products, and for a healthier life. I am really passionate about a healthier life. The ingredients in the products that I used to use were very scary, especially since they can link to cancer, skin irritations, and are overall bad for our health. If you are interested in bettering your beauty regime, share this post. I have share buttons below to make it easy, and I love comments! So comment if you have any questions, or interests in ridding your beauty cabinet of hazardous products. Each & every tips of your post are awesome. Thanks a lot for sharing. If you want to know more about Beauty products private label Manufacturer visit Dr. Korman Laboratories Ltd.